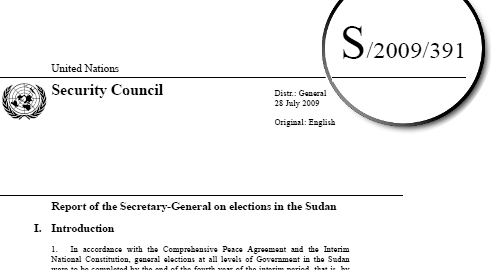 Each UN document has a unique symbol at the top right of the document or on the cover page. Symbols include both letters and numbers. Some elements of the symbol have meaning, while other elements do not. In general, the symbol does not indicate the topic of the document. Some publications have both a symbol and a sales number. The first component indicates the organ to which the document is submitted or the organ that is issuing the document. Many document symbols include sessional or year components following the body elements. In 1976 the General Assembly began the practice of including the session information in all document symbols. Before 1976, this information was not included in most document symbols. Session information appeared in Roman numerals in parentheses after the symbol for resolutions only. After 1976, other organs adopted similar practices. Subsidiary bodies generally follow the practice of the parent organ. A more exhaustive list of symbols can be found in ST/LIB/SER.B/5/Rev.5, United Nations Document Series Symbols, 1946-1996.